My neighbor stopped by with a gift. Upon examination, it was a sack of grass clippings, a side of watermelon rinds and a couple apple cores. Odd? Maybe but absolutely appreciated. She was making a contribution to our compost pile. We began composting a few years back. It’s an excellent way for us to live a little greener since 95% of what we throw into the compost is stuff that we previously ground up in our garbage disposal. It also adds value to my “hit or miss” gardening style as the soil in our yard has a lot of caliche and needs to be improved in order to grow herbs and vegetables. Composting is a cycle of life activity. It allows kitchen, office, yard and garden waste to decompose and be reborn as a nutritious enrichment for the garden, lawn, or indoor plants. There is a wide range of materials that you can use for composting such as grass clippings, weeds, leaves, shredded paper and some kitchen scraps. I even throw in unbleached cardboard roles from toilet paper. For a really extensive list of what can be composted, check out this post at little urban farm. And you can ask others to save compostables for you like stopping by your local coffee shop for a bag of grounds. They’re usually very happy to give them away. Our process is really simple. I keep a bucket under the sink in our kitchen where it’s super convenient to throw fruit and vegetable scraps, coffee grounds, tea bags, eggshells and other compostables. I don’t include any meat or dairy products and without these, there is never an odor. When full, one of us dumps it in our bin. Ours is a simple garden box that I water down and toss with a pitch fork weekly. In a house of boys, the fun begins when the decomposing starts and you feel the temperature rise and find interesting worm creatures making their home. And suddenly, behaviors are altered as I find myself sacking an apple core at the office for compost placement when I get home. If we didn’t have our own compost, our CSA will pick up table scraps weekly to use at the farm. There are even some communities that will actually pick up compostables as well. With fall settling in and cooler temperatures causing leaves to turn and fill our paths, it’s a perfect time to consider composting. Once you take the first couple of steps, it can become a part of your better living routine. What sort of autumn changes are occurring in your household? If you choose to add bacon, cook it first. Dice it and set it on paper towels to drain. Wipe out the pan. Add olive oil, onion, garlic, and vinegar. Cook for 5 or 6 minutes until the onions begin to carmelize. Add the mustard, walnuts and lemon juice and stir to combine. Add the mizuna and cook until it starts to wilt. Add the zest, salt and pepper. Combine with the pasta and serve. Tammy, I love this post – what a great reminder how simple the changes can be! I too have been known to take home the scraps and recyclables from a potluck dinner!! It is not unusual to find an apple core wrapped in a tissue in the bottom of my purse! There is another way people can compost without a pile – cold composting is where you bury your veggie and fruit kitchen scraps right in the garden or under the bushes! Work fast and helps bring the worms to the ‘table’. Great advice Doreen. I have never done that but have read about it. Well, there you go again Tammy. Great and practical advice to become more green. You’ve become my one-stop shop for new ideas about how to become more environmentally friendly. Thanks for all your hard work and for setting a great example for all of us! Hello Hannah–please look into worm composting! Really, it’s just a rubbermaid bin with composting worms (which you can order) and damp newspaper. Just dig a little hole with your fingers and add your scraps. The worms really love egg shells and will multiply quickly on their own. There is no smell if you do it right and should fit under your sink. You can use the compost for your houseplants or donate to a friend that gardens. I miss having a compost pile. We had one for 8 years in Maryland and composted almost ALL our food waste since meat is never on the menu. Last year, we joined a CSA and I talked the farmer into starting a communal compost on the farm. We took our compostable materials out there whenever we picked up our veggies. When the the farm’s season ended in May, we made special trips just to drop off compost. It seemed counter-productive to drive 10 miles RT to drop off waste. Then the weather grew too hot to keep the veggies in a covered pail in the garage for more than a couple of days before they smelled. So we stopped. I need to look into a year round solution. Both Berkeley (where we live now) and our hometown (Toronto), have city-wide compost systems. This works great for us, since we are in an apartment and don’t have our own yard. In Toronto one can pick up earth produced from the city-wide compost and use it in your garden. I know my Mom has done that a few times. Yeah, I’m pretty jealous of that one – very progressive. Very nice post, I have a compost heap in a corner of my garden. Don’t know what mizuna is, but your dish sounds lovely. Ollin – thanks for the compliment! I enjoy sharing what I know and researching what I don’t. Hannah – maybe there’s someone you can donate your compostables to? I like mustard also. Julia – I knew there were some cities that have central compost and I’m not a bit surprised that Berkeley is one of them. I may send a letter in and see if I can get a laugh here in our township. Cindy – Mizuna is a winter green. It’s a bit spicy but I’ll bet kale or mustard or arugula would also work. Paris does not offer many options in the way of composting, but when we lived in the States we had a small compost pile in our backyard. It was great, between composting and recycling we generated such a small amount of garbage! It’s a great feeling. I’ve heard that there are some new options where you have a small unit for apartments that you can use with house plants and the like. Composting is fab. And free garden compost for all means you save serious money in Spring! hmmm. A green cone. I will have to explore. Tammy, your timing, as always, is perfect. We’ve decided to plant our first garden in the spring, which means we’re going to need to start composting. Thanks for posting! Good for you. Read up. There are some great resources on the web but don’t make it too hard. It needs to be easy. My mother composts too. She cut the top off of a two-liter soft drink bottle and keeps it on her kitchen counter near her sink. We all know to leave our scraps in there! Sounds like she made it easy and accessible which is the key to it working well. I got a streamlined stainless steel compost pail with a lid that lets me leave the pail right next to the sink. Compost goes in, and when it gets full, I (or Mr. Homesteader) takes it out to the compost pile. We find that including shells really helps the quality of produce in the garden. Egg shells, shrimp shells, mussel shells . . . . The calcium helps the tomatoes and prevents blossom end rot. Those shells are the only animal products that make it into my compost. I know the egg shells are pretty common, but I’m not sure how many people use the water-based shells. They don’t stink if you cook them first. We do egg shells and have also done shrimp shells but like you, that’s as far as I go with animal products. Read up on Kate’s green cone which seems to handle anything. Hmmmm. The customer reviews online for the Green Cone aren’t very good, but I sure would like to be able to compost our animal waste. I’m really concerned about area domestic animals getting into bones and getting hurt, and I really don’t want to attract any more undesirable wild animals than we already get here. 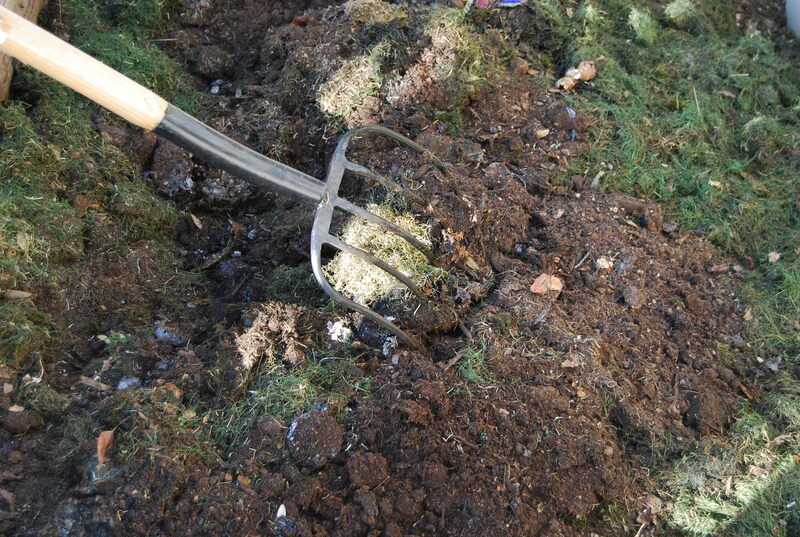 I love this gift – composting is great, although lately we would just have mould lakes, being hit by BIG RAIN. Sigh. I compost too. I collect leaves in my neighborhood. My neighbor to the north has an enjoining lawn and just blows his leaves over on to my lawn at my request. I then pick them up and put them in the compost. My other neighbor across the street gives me tons of leaves from his 4 big Maples. Both of them think I am crazy and would dump all this in the street for the municipal leaf pick up if I were not here. What they do not see is the black gold that I harvest from these composted leaves next summer – fantastic weed free compost/mulch for my garden and flower beds and it is free – just the cost of my time and work to collect it and haul it back to my pile. we were able to compost in our last apartment and miss it SO much now! hopefully it won’t be a problem in our next place! Daisy – sounds like the makings of a Joni Mitchell tune and sadly I think I remember from one of your posts that the old guy who does the newsletter probably wouldn’t be up for composting on the community grounds. June – ah! we love big rain. Dan – black gold is a very good description. Thanks for your encouragement. Simply – See Lisa’s comment on worm composting. It may work for you. Thanks Barbara. Ozarkhomesteader also talks about how important shells are. Absolutely! I have been composting for along time, and now that I am settled in here in the Far North without a good composting system, I Gift my friend Gail with my kitchen waste for her compost pile. (And I have to say that even without meat and dairy in the mix, it can get pretty stinky sometimes.) What a difference putting that stuff aside can make in so many ways – less weight, smell, and sogginess in the trash can; better soil in your gardens; a raised consciousness of what “throw away” means. As always, your thoughts are inspiring. Ravi- I put tea bags in the compost and have some roses that aren’t looking so well so maybe I’ll see if I can help them along. Cris – I took you for a composter! Great that you’re sharing with a friend. Estrella – I also learned composting from my grandparents. My Dad has done that as long as I can remember. He has a small compost pile in the garden, and all the organic waste from m parents’ kitchen goes there. In the house where I live there’s no compost pile, but in Germany people are very much into waste separation, and we all collect our organic waste in brown garbage bins that are taken by the garbage removal, and the organic waste is collected for further use in agriculture. I didn’t realize you are in Germany. I love that concept. From Julia’s comments, it sounds as though they are doing something similar in Canada. Ha! Wish I’d thought of that. I’d love to compost. We’re not there yet but I hope to get there someday. Baby steps. Yes, see Lisa’s comment about a worm compost below. It sounds like an interesting way to start. That is very kind of you Tes. Thank you. In our family we are taking all the flowers and leave remains to a separate heap. Being there two years I move them to another separate heap in which mould is becoming ready for reuse in our garden in few years. I know that this method with two heaps is slow, but it works for us. We are not in hurry. Before winter comes and we take off all of our water barrels from drainpipes then I water with them the first heap. Last thing my wife is putting some substance which helps mould making in this heap during long winter under the snow cover. Sorry my bad English to understand what I mean. Your English is fine. I wish I could do my website in three languages. I want to learn more about rainwater harvesting that you and others are doing. Hi Tammy! As Thanksgiving is upon us, I wanted to take a minute to say how thankful I am for your blog. These are issues I have opinions about, but not as much knowledge as I’d like. Your perspective and insights are welcome. And so are your recipes! Keep up the lovely writing! What a lovely thing for you to say. Thank you so much for reading it. I enjoy blogging and am thankful for readers like you. As a city girl I don’t have the need for composting but my hope is to find a home with enough room for a garden. There are two growing seasons in our area in AZ. Yes, I might even be your neighbor and I need to convince you that you do have a need for composting. We have been composting for quite some time now, and what a great blessing! Now, Bill and I have recognized that we have too much stuff. The goal, as we move into the new year, is to get rid of stuff, give it away, shred it, take it to the recycling bins, whatever. Simplify! And your stuff will be someone else’s treasure.